Noise is any unwanted sound and in cars is not the intended output but unintended by product of manufacturing shortcomings in terms of material used ( Light guage sheet metal for the body), gaps between car doors, windows and chassis or weather conditions like winds, heavy downpour, even heavy traffic. Sound is defined as vibrations that travel through the air or another medium and can be heard when they reach a person's or animal's ear. In order to get the noises in your car to actually take a dive we need to use a barrier to contain the unwanted sound either by absorbing the sound or dampening it. So depending on the source of the noise we can either use one or combination of products mentioned below for maximum effect. The first step in making a vehicle cabin quierer involves using a Constraint Layer Vibrarion Dampers(CLD) noise dive 360. We offer 100% butyl with aluminium foil as a consrtaint layer vibrarion dampers to contain the vibration by altering the resonant frequency of the treated body panel from a resonant frequency which is audible to a resonant frequency lower than the range of the human hearing range. Noise dibe 360 when applide to the interior of your car will result in perceptible reduction in NHV (Noise Harshness Vibration) levels. Noise dive 360's superior insulation along with aluminium liner offers added benefit of regulating temperature within the cabin by blocking engine heat and also insulates against external weather conditions. The performance of the music system is worst hit on accoumt of external noise as well as the resonance arising out of the sperkers themselves.noise dive 360 contains the resonance and audible coloration from the speakers thereby increasing their usable dynamic range. We understand that a car is not just a means to an end to you but a valuable asset and important part of your life. We treat your vehicle with utmost respect and are here to make sure you get your money’s worth. All our products are imported from the best companies around the world and held to the highest quality standards in the most revered automotive countries of the world. 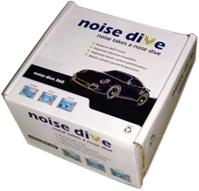 The products have been personally tested and tried by our team of engineers at Noise Dive on a whole range of vehicles including our own and only after meeting our exacting quality standards have been introduced to you the customer. We take quality and safety very seriously and these aren’t some management jargons but principles on which our company’s foundation is based on. The first step in making a vehicle cabin quieter involves using Butyl and aluminum Constrained Layer Damping material (CLD) noise dive 360. Designed for damping metal or plastics and reducing unwanted structural vibration, rattles and sound from inside or outside of your car. High efficiency to convert vibration to thermal energy by altering the resonant frequency of the treated body panel form a resonant frequency which is audible to a resonant frequency lower than the range of the human hearing range. Highly adhesive and easily conform to irregular surfaces like door panels or roof interior. A sound wave continues to bounce around a vehicle cabin until it has lost all its energy. Ideally the sound should get absorbed completely. Noise dive Studio fx is a Open Cell Polyurethane Acoustical Foam, scientifically engineered pattern designed to absorb the widest range of frequencies, by increased absorption area. Effectively reduces reflected noise and reverberation times (echo) to produce safe and enjoyable environment. for a recording studio like absolutely incredible sound. Closed Cell Foam (CCF) absorption material with an adhesive back. To decouple and absorb vibration caused by the resonation characteristics of any panels. Stops rattles and squeaks. especially engineered to absorb air borne noise. 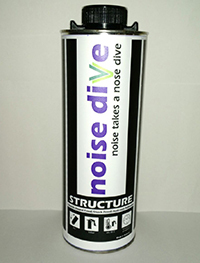 Noise dive Structure is a rubberized adhesive that forms a 2-4 mm thick coating on the underside of the car. IT insulates against road noise and offers stone chip protection, makes for a more pleasant and quieter ride. Noise dive Structure also doubles as a Anti-Rust. It creates a protective barrier that seals out grit, grime and moisture that could otherwise corrode the metal components. Its a Easy to use spray on formulation with superior coverage for fewer coats. A uniform black underbody coating gives a car a clean look.